I love the quilt but I love that fabric! LOVE it! Katy Jones! Just her thing, lucky girl. I'd love to make that quilt in blue and white. Great quilt - how about some Chicopee on a solid coloured background? 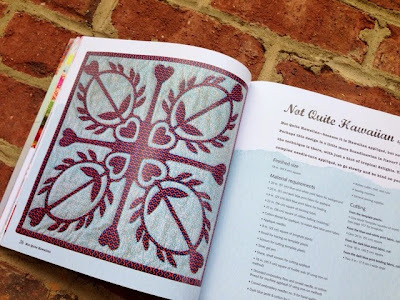 Love the quilt, but I have no idea who you made it for, so I will tell you that I would use a batik background closer to blue and a batik in a green as the accent. I know what I see in my mind, but I couldn't find it online right now. I'd like to see it in a Faffe print on a black or gray background. My money is on Katy (imagingermonkey). She loves a bit of gold! Katy is the first person I thought of...even without looking at the list! btw...you did a fabulous job on the blanket stitching...I sure wish my machine had that stitch!!! Hmm. Machine appliqué. I can do that. I wonder is my swap partner would like this? 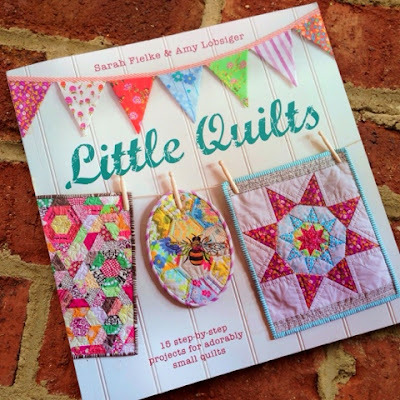 Love this little quilt and your blanket stitching. I'd probably go with a bright multi-color print on a white or gray background. I think Kona solids in leafy green and ocean blue would be lovely. A bright orange on mint green with pale yellow stitching. Yellow and blue a combo of solids and prints. Love your mini! Great choice of abrics as well. 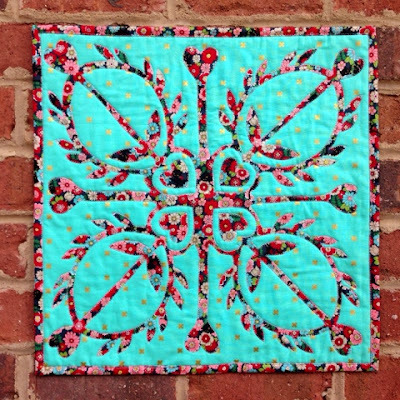 I'd love to make this with a green batik and an 1800 creme background, mixing the two like Edyta Sitar from Laundry Basket Quilts does. I would guess with the small print you had Katy jones in mind. Thanks for the chance to win. Could it be Sue Spago? Love the cat print. 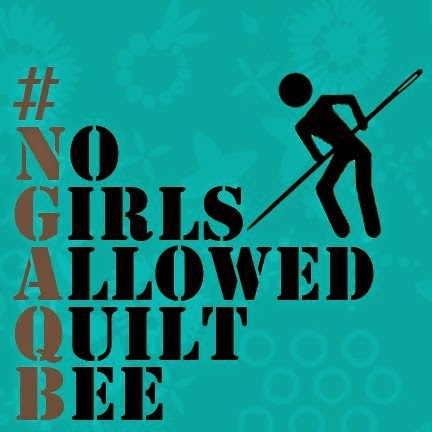 Sincerely, Paula K.
I love your interpretation of this quilt! My guess is Katy, too. And don't you think this would be amazing in some lower volume Carolyn Friedlander prints? I just might have to try that. I really like your choice of fabrics. My guess is Katy Jones as well. This mini is seriously bananas!! I love it. Not quite Hawaiian using Robert Kaufman yarn died linen in steel with pink print Liberty Tana Lawn would be fun. My guess is Katy. I would like to see it with blue and white. I think your gorgeous quilt was made for Kay J. Love the little kittens in that fabric. If that quilt isn't for Katy Monkey then I'll eat my hat! I'll go with Katy Jones too! I know I'm boring, but I have to go with Katy J as well!! 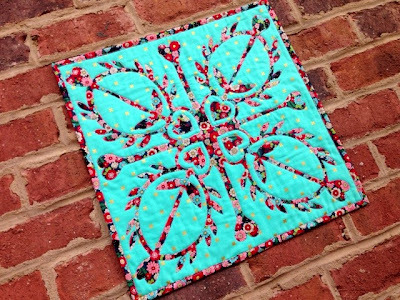 I would use white background with a turquoises, red, white print..I LOVE mini quilts!! I love "SWAPPING" mini quilts too! My guess was that ginger monkey too! Glad to see others thought so too. Your version is so adorable, I wish it was for me!!! This is gorgeous!!! I would choose a floral pattern for the design and a solid for the background... I just bought some Liberty Lawn fabric in blues and a solid Kona gray back ground would look pretty swish together!!! 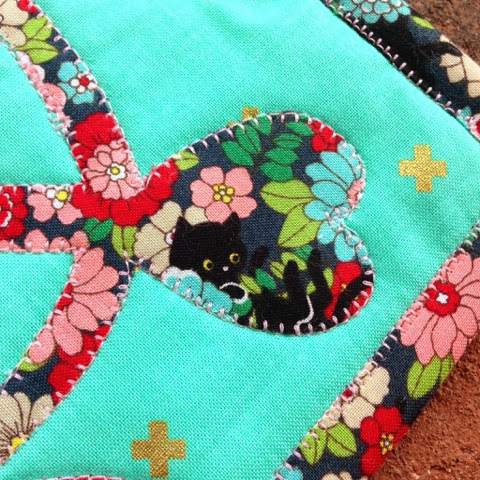 I am saving your project on my Sew Sweet Pinterest board!!!! Katy. Love that quilt. I would go with my usual blues and yellows. Thanks for the chance. My guess is also Katy. I'd love to make it in red and white. This is really pretty. I think a darker patterned background like Bonnie Christine's Orchard Blossom in Spring, with a smaller print like Garden Gate in Citron for the design. Love the kitty and flower print! 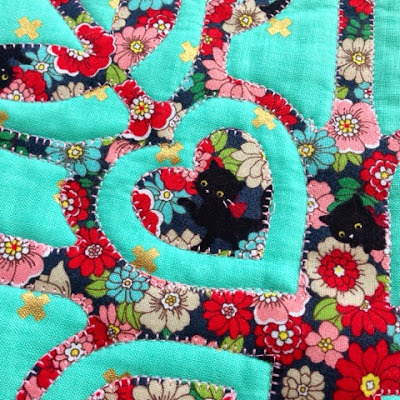 OK, judging by what the others are posting, my guess is that this quilt is for Katy! 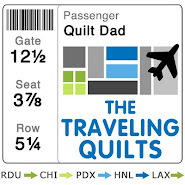 I'd love to see this quilt made in purple and lime green...my favorite color combo! 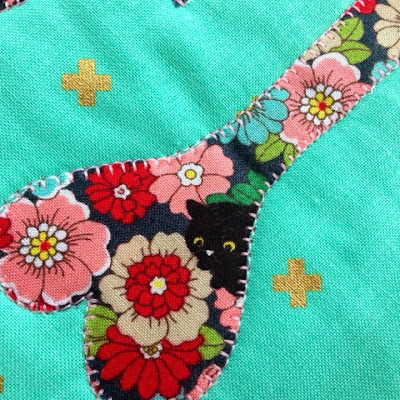 Because of the cute little kitties on the fabric, my guess is that it is for Pam Vieira-McGinnis - IG @pamkittymorning. Must be for Katy. Who could not love this. I can imagine this with a black background and a bright batik design, but there are so many possibilities! I think it's for Pam Kitty Morning!